Telaendril is a Bosmer member of the Dark Brotherhood, living at their Sanctuary in Cheydinhal. Telaendril seems to have been following Ocheeva's instructions to scout in different locations and due to this she will spend all the time traveling back and forth to the Sanctuary. While she's at the Sanctuary on Morndas, Middas and Fredas, she will wander around the Sanctuary Hall from 12am to 6am, when she will head to Training Room to practice her skills with the bow. After having finished her training, she will head to the Living Quarters to have a three-hour meal until her bedtime. After she has rested for a moment, she will wake up at 8pm to have her second meal of the day, this time for a period of five hours. At 1am, on Tirdas, she will leave the Sanctuary to depart towards the Cheydinhal Bridge Inn, where she will spend the entire day on the floor upstairs eating until 12am, when she will return to the Sanctuary. On Turdas she will leave the Sanctuary at 1am again, this time to locate near the well of the local Mages Guild, always strolling around it. And on Loredas she will depart to the city of Leyawiin through the east gate, taking the Blue Road first until she finds the Red Ring Road and turning at the first intersection to take the Yellow Road. Once she has arrived she will spend the next two days scouting around the Castle grounds, until she returns to Cheydinhal on Sundas at 12am. While she is at the Sanctuary she will wear the Dark Brotherhood's shrouded armor and hood. She also carries her second outfit with her: a brown shirt, a pair of light brown linens and pigskin shoes. She also possesses a steel bow, a leveled amount of steel arrows, a potion of sorcery, a few pieces of venison, the key to the abandoned house, her personal key and a leveled amount of gold. Telaendril knows a Chameleon spell and also possesses an ability which gives her resist magic and normal weapons 20%. When you first approach her, she will politely say, "It is an honor to make your acquaintance." When you talk to her, she will happily welcome you to the Sanctuary rather formally:"Warmest welcomes to you. I am Telaendril. Wood Elf and loyal daughter of Sithis. I hope you find our Sanctuary to your liking." Afterwards, her dialogue will differ with her disposition. If you approach her when her disposition is above 70, she will say, "Seeing you again is like a blessing from the Night Mother herself!" When you talk with her, she will say, "Hello, Brother. It's good to see you again. The Night Mother has been smiling upon you, I hope." or "Hello, sweet Sister. It warms my heart to see you again. The Night Mother has been smiling upon you, I hope." If you approach her when her disposition is between 30 and 70 she will say: "What is it, Brother/Sister?" and when you talk to her, she will say "Hello, Brother. How can I help you?" or "Hello, Sister. Can I help you with something?". If you approach her when her disposition is below 30, however, she will be rather scornful towards you. "You. I hoped Sithis would have claimed you by now." And when you talk to her, she will be no less hateful: "I find your very presence foul. Say what you will and then leave my sight!" If you leave conversation with her when her disposition is above 30, she will say, "May your arrows always strike true!" If below 30, however, she will say, "By Sithis, I hope you shoot your own eye out..."
However, if you attempt to talk to her while outside the Sanctuary, she will dismiss you by saying:"Not here! Not in public! We must never speak to each other outside the Sanctuary! The risk of detection is too great!". She seems to be in the urge to tell someone a rumor about her guild member Gogron gro-Bolmog, and if you ask her she just won't resist to tell it:"Oh, I shouldn't...well all right. Gogron had a pet rabbit as a child! He petted the thing so hard he crushed its skull! Ha ha ha! What a brute!" Telaendril takes much pride in herself and her elven heritage. When you ask her about the sanctuary, she will be somewhat homesick, "In truth, I miss the towering elms of my native Valenwood. But I was banished from there, for deeds I don't care to discuss. This is my home now." When you ask her about the Night Mother, she will proudly state, "Our Lady is surely an ancient and powerful elf. Someday, when I am Listener of the Black Hand, I will look upon her beautiful and unholy form!" She also knows a bit about Sithis "Long ago, in an age now forgotten, Sithis came to the Night Mother and begat her five sons. So you see, his love gave birth to the Dark Brotherhood." 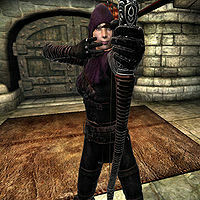 She was originally a target for the Dark Brotherhood, and when you ask her about Lucien Lachance, she will explain you how she was able to join the Guild: "Actually, Lucien did not try to recruit me. Not at first. He tried to kill me. My father wanted me dead, and he hired the Dark Brotherhood to do it. I escaped from Lucien, and paid my father back for his treachery. Lucien came to me again that night with an offer I just couldn't refuse." "Pirates, eh? They tend to be quick, and good with a blade, but don't favor armor. They're not fond of bows or spells, either." "So, you come to me for assistance. How interesting. I think I'd much rather you die in the field." "Yes, you'll find that some jobs require you to terminate a mark in a specific way. It's well worth the trouble, considering how good the bonuses are." "This contract requires stealth and subtlety. You possess neither. When you fail, I will gladly take your place." "This prisoner, why give him a chance to escape, or fight back? Pierce his heart with an arrow, right through the bars of the cell. Quick and easy." "Vicente wants YOU to infiltrate the Imperial Prison? I didn't realize you had such a good sense of humor." "Remember, timing is everything. You need to slash Motierre with the blade in Hides-His-Heart's presence, and then flee before the enforcer can react." "Bah! You have neither the skill nor the daring to fulfill this contract. I hope the moneylender cuts out your heart." "I'd never suggest you forfeit a bonus, of course, but killing Faelian indoors is so unappealing. Too bad you couldn't snipe him from a balcony. But first I guess you have to find him, right? The Elven races of the Imperial City are a community unto themselves. Ask them about Faelian." "So, you need to find this High Elf, hmm? Why don't you take a trip to Summerset Isle, ask around for him there. Idiot." "Ah, now this is the type of contract I live for! You must become pure shadow. It's as if you were never there, and then Roderick simply... dies." "This is an outrage! This contract should have gone to me! My stealth skills are unmatched! You will never succeed! Never!" "Take your time with this one. Observe the other guests. Learn their schedules and behaviors, and strike each one when they're alone. Use your silver tongue. Try to befriend the guests, and then you may be able to lure them to their own dooms! Hahahahahaha!" "You come to me for knowledge, for advice? I would sooner see you flounder in a pool of your own blood. Good luck, worm." "The Rose of Sithis! Such an honor! Just make sure your marksmanship is up to the task. If you miss the target, the enchantment will be wasted." "Ah, of course. You're going to succeed where three previous family members have failed. How silly of me..."
Telaendril does not leave the Dark Brotherhood Sanctuary to start her travels until you observe her conversation with Gogron during A Knife in the Dark. Although Telaendril's note to Ocheeva states that she will watch over the Sanctuary well on Turdas, she is actually set to watch over the Cheydinhal Mages Guild well instead. Esta página foi modificada pela última vez à(s) 03h23min de 29 de julho de 2015.